West Bromwich Albion edged a five-goal thriller against Preston to move to within a point of leaders Newcastle. Ben Watson put the home side ahead with a low drive before Chris Brunt made it two with his 11th of the season. Sean St Ledger pulled a goal back for the visitors with a diving header from Ross Wallace's cross but Graham Dorrans added a third with a 30-yard free-kick. Neil Mellor rounded Scott Carson to reduce the deficit but West Brom held on after a goalless second period. Both sides had chances after the restart, however, and Albion keeper Carson did well to deny former Baggies midfielder Richard Chaplow after the break. His opposite number Lonergan parried a decent Watson effort at the other end and Gabriel Tamas saw his header cleared off the line by St Ledger. Keeper Lonergan then pulled off a smart double stop to deny Miller before Dorrans blazed over when he could have wrapped the game up. A tense final quarter of an hour ensued but the Baggies held their nerve to end North End's five-match unbeaten run. "Nothing has been achieved. Nothing has changed from last week. "We have got another game coming up on Wednesday (against Coventry) and it is important that we do well again because the teams behind us keep picking up points as well. "We are in a good position but as you know, you can lose it very quickly in football. "It was important to get three points against Preston as we need to do well in our home games." "We conceded two poor goals and gave ourselves a mountain to climb. "They were sloppy goals but we dug in and kept going and West Brom will know they have been in a game. "We had some sustained pressure but the goals we are conceding are costing us points. "But it was our first defeat in six and we have to get ready to go again on Tuesday (against Middlesbrough) in another big game." 90:00+3:11 The game is over, as the referee blows his whistle. 90:00+2:35 Corner taken by Keith Treacy, Ben Watson makes a clearance. 90:00+1:20 Giles Barnes decides to take a short corner. 90:00+0:16 Jon Parkin concedes a free kick for a foul on Abdoulaye Meite. Free kick taken by Scott Carson. 89:35 Foul by Keith Treacy on Giles Barnes, free kick awarded. Gabriel Tamas restarts play with the free kick. 87:59 The assistant referee signals for offside against Keith Treacy. Scott Carson takes the indirect free kick. 86:26 Substitution James Morrison joins the action as a substitute, replacing Chris Brunt. 85:42 Free kick awarded for an unfair challenge on Youssouf Mulumbu by Richard Chaplow. Gabriel Tamas restarts play with the free kick. 84:04 Gabriel Tamas fouled by Liam Chilvers, the ref awards a free kick. Scott Carson restarts play with the free kick. 83:26 Unfair challenge on Jon Parkin by Gabriel Tamas results in a free kick. Free kick taken by Ross Wallace. 81:35 Substitution Keith Treacy joins the action as a substitute, replacing Chris Sedgwick. 81:35 Substitution (Preston) makes a substitution, with Jon Parkin coming on for Chris Brown. 80:10 Free kick taken by Ben Watson. 80:10 Booking Liam Chilvers goes into the referee's book for unsporting behaviour. 79:35 Free kick awarded for a foul by Liam Chilvers on Luke Moore. 78:19 Unfair challenge on Gabriel Tamas by Neil Mellor results in a free kick. Direct free kick taken by Scott Carson. 76:53 Matthew James sends in a cross, clearance made by Abdoulaye Meite. 76:06 The ball is swung over by Neil Mellor. 74:17 The ball is delivered by Chris Sedgwick, save made by Scott Carson. 73:18 Luke Moore crosses the ball, Shot on goal by Graham Dorrans from just inside the area clears the crossbar. 72:49 Gabriel Tamas takes the direct free kick. 72:49 Booking Richard Chaplow receives a caution. 72:28 Richard Chaplow challenges Youssouf Mulumbu unfairly and gives away a free kick. 71:14 Substitution Luke Moore is brought on as a substitute for Ishmael Miller. 70:34 Inswinging corner taken by Graham Dorrans from the left by-line, Header from deep inside the area by Gabriel Tamas goes harmlessly over the crossbar. 70:15 Michael Hart gives away a free kick for an unfair challenge on Chris Brunt. Chris Brunt takes the direct free kick. 67:18 Matthew James takes a shot from inside the box clearing the bar. 66:17 Ishmael Miller fouled by Liam Chilvers, the ref awards a free kick. The free kick is delivered right-footed by Gabriel Tamas from right channel. 64:34 Substitution Giles Barnes comes on in place of Robert Koren. 63:27 Unfair challenge on Matthew James by Chris Brunt results in a free kick. Liam Chilvers takes the direct free kick. 62:53 Inswinging corner taken right-footed by Graham Dorrans from the left by-line to the near post, Michael Hart makes a clearance. 62:37 Effort on goal by Ishmael Miller from 18 yards. Save made by Andy Lonergan. 62:24 Ishmael Miller takes a shot. Save by Andy Lonergan. 60:59 Shot from just outside the box by Robert Koren misses to the left of the goal. 60:05 Inswinging corner taken left-footed by Chris Brunt from the right by-line, Gabriel Tamas takes a shot. Sean St. Ledger gets a block in. 59:49 Ben Watson takes a shot. Save by Andy Lonergan. 58:50 Corner taken left-footed by Ross Wallace, Gianni Zuiverloon makes a clearance. 58:08 A cross is delivered by Callum Davidson, Neil Mellor takes a shot. Scott Carson makes a save. 57:09 Centre by Michael Hart, Gianni Zuiverloon makes a clearance. 55:39 Michael Hart gives away a free kick for an unfair challenge on Marek Cech. Chris Brunt has an effort direct from the free kick, save by Andy Lonergan. 52:48 The ball is sent over by Richard Chaplow, save made by Scott Carson. 50:59 Corner taken left-footed by Ross Wallace from the left by-line to the near post, Gabriel Tamas manages to make a clearance. 50:03 Richard Chaplow has an effort direct from the free kick, save by Scott Carson. 50:03 Booking Abdoulaye Meite receives a yellow card. 49:27 Neil Mellor fouled by Abdoulaye Meite, the ref awards a free kick. 48:48 Ishmael Miller is caught offside. Sean St. Ledger takes the indirect free kick. 48:04 The referee blows for offside against Ishmael Miller. Indirect free kick taken by Sean St. Ledger. 46:20 Chris Brunt crosses the ball. 45:43 The ball is delivered by Ross Wallace, Marek Cech makes a clearance. 45:09 Foul by Graham Dorrans on Matthew James, free kick awarded. Matthew James restarts play with the free kick. 45:00+3:02 The match has reached half-time. 44:04 Foul by Gianni Zuiverloon on Ross Wallace, free kick awarded. Ross Wallace takes the direct free kick. 42:37 Assist on the goal came from Ross Wallace. 42:37 GOAL - Neil Mellor:West Brom 3 - 2 Preston Neil Mellor finds the net with a goal from inside the penalty area to the bottom right corner of the goal. West Brom 3-2 Preston. 42:19 Gianni Zuiverloon delivers the ball, Sean St. Ledger manages to make a clearance. 37:46 The ball is crossed by Chris Sedgwick, Neil Mellor takes a shot. Save by Scott Carson. 37:24 Neil Mellor takes a shot. Abdoulaye Meite gets a block in. 36:37 Robert Koren produces a right-footed shot from just outside the area that goes harmlessly over the bar. 36:32 Chris Brunt crosses the ball, Chris Brown makes a clearance. 35:51 Free kick crossed right-footed by Graham Dorrans, clearance by Sean St. Ledger. 35:51 Booking The referee cautions Chris Sedgwick for unsporting behaviour. 35:36 Chris Sedgwick gives away a free kick for an unfair challenge on Marek Cech. 35:02 Graham Dorrans crosses the ball, save by Andy Lonergan. 32:27 GOAL - Graham Dorrans:West Brom 3 - 1 Preston Graham Dorrans finds the net from the free kick from 35 yards. West Brom 3-1 Preston. 31:18 Foul by Callum Davidson on Ishmael Miller, free kick awarded. 29:58 Robert Koren has an effort at goal from 20 yards. Save by Andy Lonergan. 28:56 The official flags Chris Brown offside. Indirect free kick taken by Gianni Zuiverloon. 28:07 Chris Brown concedes a free kick for a foul on Gabriel Tamas. Direct free kick taken by Graham Dorrans. 27:26 A cross is delivered by Ishmael Miller, Chris Brunt has an effort at goal from close in which goes wide left of the target. 24:47 Ben Watson takes a shot. Blocked by Sean St. Ledger. 24:19 Corner taken right-footed by Graham Dorrans from the left by-line to the near post, Chris Sedgwick manages to make a clearance. 24:07 The ball is delivered by Chris Brunt. 21:30 Corner taken by Richard Chaplow from the right by-line to the near post, clearance made by Ben Watson. 21:05 Corner taken by Richard Chaplow from the right by-line played to the near post, clearance made by Ben Watson. 20:19 Gianni Zuiverloon gives away a free kick for an unfair challenge on Ross Wallace. The free kick is swung in left-footed by Ross Wallace, save by Scott Carson. 19:31 Ross Wallace takes a outswinging corner to the near post, Ben Watson makes a clearance. 19:02 Inswinging corner taken by Ross Wallace from the right by-line. 18:41 Matthew James takes a shot. Blocked by Ben Watson. 17:58 Free kick awarded for an unfair challenge on Chris Brown by Abdoulaye Meite. Free kick crossed by Ross Wallace, clearance by Youssouf Mulumbu. 16:41 The ball is sent over by Michael Hart, clearance by Gabriel Tamas. 16:23 Michael Hart crosses the ball, Abdoulaye Meite manages to make a clearance. 14:54 Ross Wallace provided the assist for the goal. 14:54 GOAL - Sean St. Ledger:West Brom 2 - 1 Preston Sean St. Ledger finds the back of the net with a headed goal from deep inside the penalty area. 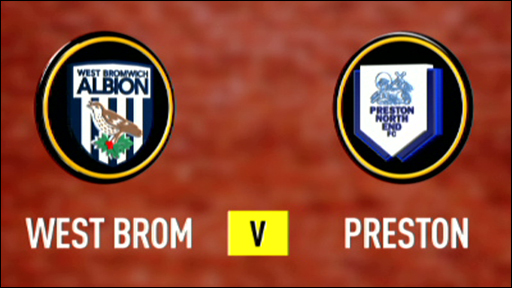 West Brom 2-1 Preston. 14:04 The ball is swung over by Ross Wallace, Chris Sedgwick takes a shot. Scott Carson makes a save. 12:10 Graham Dorrans crosses the ball. 10:51 Corner taken right-footed by Graham Dorrans to the near post, save by Andy Lonergan. 10:11 The referee blows for offside. Abdoulaye Meite takes the indirect free kick. 8:31 The assist for the goal came from Graham Dorrans. 8:31 GOAL - Chris Brunt:West Brom 2 - 0 Preston Chris Brunt gets on the score sheet with a goal from the edge of the penalty area to the bottom left corner of the goal. West Brom 2-0 Preston. 6:22 Assist on the goal came from Robert Koren. 6:22 GOAL - Ben Watson:West Brom 1 - 0 Preston Ben Watson grabs a goal from just inside the penalty area to the bottom left corner of the goal. West Brom 1-0 Preston. 5:23 Ross Wallace delivers the ball. 3:35 The ball is delivered by Chris Sedgwick, Gabriel Tamas makes a clearance.